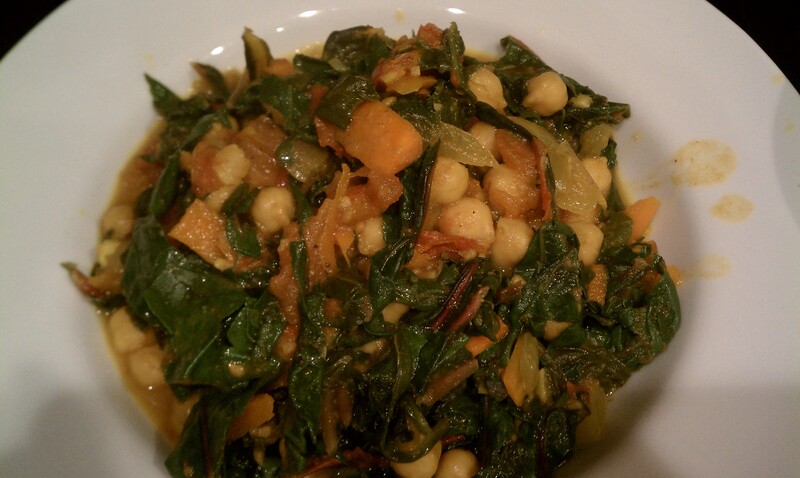 When the cupboards are bare and there is almost nothing in the house to eat because the next day is grocery shopping day, our go-to dinner is curried vegetables. Here’s the quick play by play for a delicious and filling dinner in less than 30 minutes. 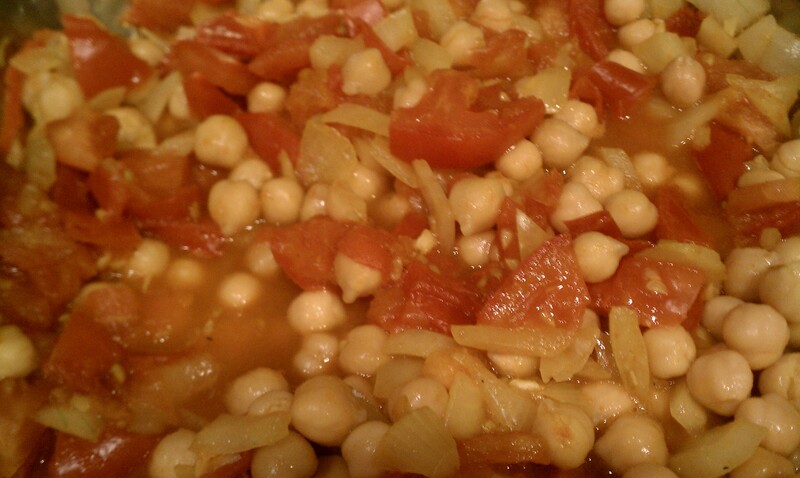 -Add chopped tomatoes, diced white onions, and garlic to taste (We use lots of garlic at least 4-5 cloves or use the pre-chopped jarred garlic.) Saute all ingredients until the onions have turned translucent. 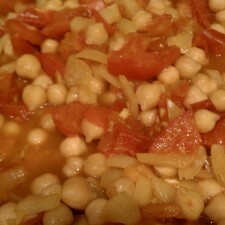 Add a can of chick peas. 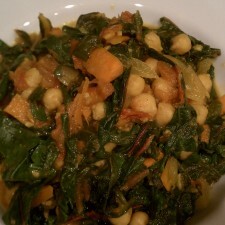 -Flavor with yellow curry powder, turmeric, and black pepper. A little sea salt never hurts either. Use a lot of curry and turmeric. Enough that all the vegetables are a nice yellowed hued and there is a sweet fragrant aroma starting to fill the kitchen. 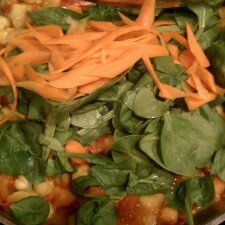 – Next add carrots, spinach, and rainbow chard. That’s what we keep in the house, but any vegetables would be good here as long as they don’t need a long time to saute. If so, add them in earlier with the tomatoes. Usually, I add broccoli sooner rather than later because I like it very soft. 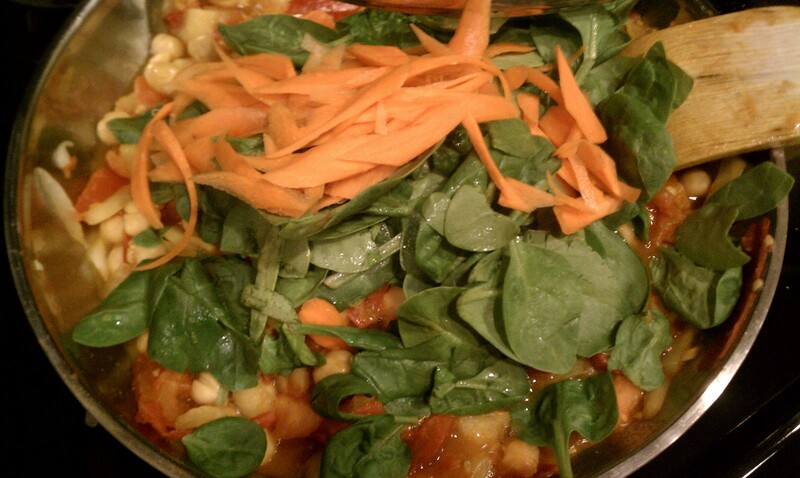 Also, what looks like a lot of greens, will cook down to almost nothing, so add lots and lots of spinach and chard to get a decent amount. In no time at all, you have an all vegan, no trans-fat healthy meal! Enjoy!